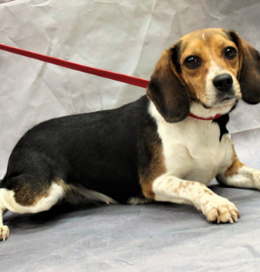 Dorothy is a small, beautiful, smart and friendly girl that entered rescue as the youngest in a close knit group of four female beagles left in the night drop pen at a local animal shelter. She is healthy and active as only a toddler can be. She and the rest of the group are very skittish and do not seem to have had much contact with the outside world. Everyday noises that we take for granted such as lawnmowers or closing doors startle Dorothy and send her scurrying for cover. We went outside in the rain last week and I opened an umbrella for cover and Dorothy nearly jumped out of her skin. She feels much more secure in the house. She has no problem sleeping, eating or playing with her toy. She sometimes gets bursts of energy and races around the room in joy at her ability to run. She does not mind spending time in a crate and will often go in the crate to rest during our evening relaxation time. It is hard to pinpoint her origins, but a hunting dog (or possibly a breeder) comes to mind. While she is calm and easygoing indoors, she is edgy and alert outside. She is always looking for a critter, and when she spots one, she goes to hunt mode. She just seems to tune out the world to focus on her critter. For this reason, a secure fenced yard is required in Dorothy’s new home. She will go over low fences or under if there is a hole to get to the chase. It almost seems that she was trained to go to the bathroom inside and be on the hunt whenever she steps outside. This is slowly changing as we work on house training. She is a smart girl and should pick up the rules as we move forward. She has not been spayed yet and is possibly in heat so we do not go for walks. All of her leash training is within the confines of our back yard. She has learned that to go out, she must put on a harness, so when we get ready to go, she patiently waits for me to get her gear in place. She does seem to be less intense when we go outside as time passes, but she still pulls hard on the leash to get where she wants to be. Being a beagle, she has a mild stubborn streak, but if she had free run in her own yard, I’m sure this would be less obvious. She loves people and craves the attention of being the cutest, youngest pup in the room. However, if left to her own devices, she doesn’t get bored. She will grab her stuffed toy, a rawhide or the nearest nylabone to entertain herself. She rarely whines when left behind, and waits patiently in the morning if you want a few extra winks on the weekend. She doesn’t bark much, but as you can see from the pictures, she is nosy and wants to know what is going on. Dorothy is currently living with one of her buddies from the past. While they play together some time, I feel she relies on Sophia’s presence for her confidence. They still will often crawl in the same crate to rest. At first when separated, they would scream, but now are less attached at the hip. I do believe that the presence of another gentle dog will help Dorothy overcome her misgivings of a new home, and once she gets to know and trust her new pal, she will rely on him/her for support and courage. Dorothy has a ways to go to perfect pet status, but she has already come a good distance from the discarded little girl found in the night pen.